24/7 machinery and factory plant maintenance. Experienced engineers ready to solve most difficult problems. We are the people you can rely on! Whether it is 12pm or 12am you can benefit from our emergency and disaster recovery services. On site plant repair and servicing! Gas welding, electric welding MIG (steel, stainless steel), TIG Welding (mild steel, stainless steel, aluminium). We provide comprehensive machinery servicing and maintenance services across all industries starting from simple devices and single machines to complete production lines. We offer factory plant repair services of the highest quality. We work in accordance with the international standards and in accordance with technical conditions and requirement provided by machinery manufactures. We have professional equipment and qualified staff. Our goal is to satisfy our customers. For many years, our London machinery moving company specializes in the provision of maintenance services for manufacturing companies. We are making duplicate parts of machines, equipment and service lines. We can support the maintenance department of your company in the periodic inspections and maintenance. 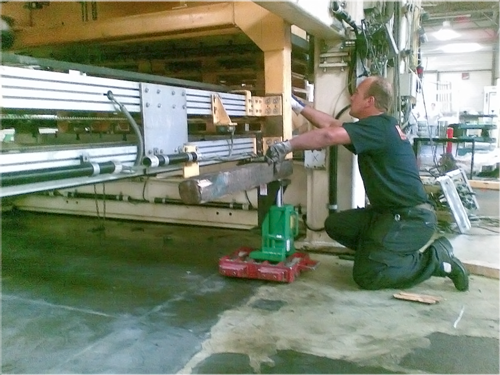 On request, we can also make alterations or modifications to existing production lines. We build machines for different types of manufacturers. We offer the possibility of machinery making based on the documentation provided by the customer or on our own projects. On request, we can make improvements and modifications to existing production lines. We offer all kinds of production line components such as transport systems (conveyors), tables, containers and other items made ​​of stainless steel, etc. We also build custom equipment for special orders. Machinery Maintenance London is a family business established in 1988. Our activity is related to mechanical and manufacturing industry. We provide a wide range of repair services for small and large manufacturing companies in the food, furniture, agriculture, construction, building, printing, car production and many other various industries. We have developed a large group of regular, long-term, customers by providing superior quality machinery and plant servicing solutions, timeliness of assignments and competitive prices. We guarantee professionalism, integrity and reliability. We invite you to familiarize with the offer placed on our website and we encourage you to contact us directly for more details and use our services. We also deal with various types of construction welding of steel and stainless steel, according to customer requirements. We weld steel, cast iron, aluminium and other materials. We also provide services for garages consisting of grinding (planning) automotive heads, rolling disc and drum brakes and welding and regeneration of various components. On request we can also make various types of non-standard parts. We regenerate abrasive surfaces of vegetable peelers. Regeneration involves the removal of the spent corundum layer and applying a new one, to allow re-use of the device in accordance with the parameters of the production process. We possess several years of experience in the field of regeneration of peelers used in the food industry. We invite food manufactures, which in their production processes use such equipment, as well as restaurants, hotels, schools, hospitals and other workplaces. We carry out repairs of electronic equipment and mechanical devices. We supply machine parts, tools and other industrial equipment. 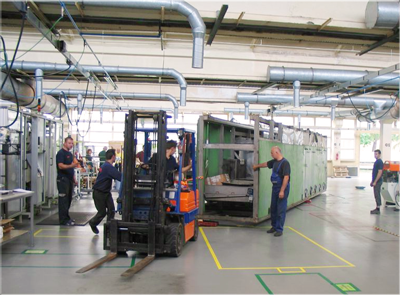 We perform periodic inspections and maintenance of machinery and production lines. We perform upgrades of numerically controlled machine tools and other factory plant. We employ trained machinery servicing engineers and other technical staff in London that held a series of seminars in the UK and abroad, and obtained certificates for such machinery manufactures like Siemens, GENERAL-ELECTRIC, AEG, NUCON, NUMS. International control: NUMS, NUCON 400. Repairing broken plants and machinery and plant servicing is what we do best.